TEL AVIV — Israeli Prime Minister Benjamin Netanyahu vowed he would be vindicated Tuesday moments after police recommended that he be indicted on charges of corruption and bribery. "This will end in nothing," a defiant Netanyahu declared after police made the announcement. A police spokesman, however, said their case against the longtime Israeli leader is solid and based on — among other things — interviews with some 80 witnesses. They charge that from 2007 to 2016 Netanyahu and his family received cigars, champagne and jewelry worth "hundreds of thousands of shekels" from Hollywood mogul Arnon Milchan and other supporters. In return, Netanyahu pushed for the so-called Milchan Law, which ensures that Israelis who return to live in Israel from abroad are exempt from paying taxes for 10 years. "The findings of the investigation revealed that the relationship between the prime minister and Mr. Milchan was a bribery relationship that amounted to a criminal offense and not an innocent relationship between friends," the police spokesman said. "Bibi," as he is known, is also accused of working out a deal for favorable coverage with Arnon "Noni" Moses, the publisher of an Israeli newspaper, Yediot Aharonot, in exchange for backing a bill that would weaken a rival newspaper. Now that police have made the recommendation, the decision on whether to indict Netanyahu rests ultimately with Attorney General Avichai Mandelblit. Both Milchan and Moses also face possible bribery charges, the police spokesman said. Mandelblit, 54, is Netanyahu's former cabinet secretary and has already rebuffed calls to recuse himself from this case. While no stranger to scandal, this is the first time Netanyahu faces the possibility of being formally charged with a crime. But it could be a year before that happens. First, the police recommendations have to be vetted by a tax attorney in the AG's office, a process that could take about three months. That lawyer's conclusions then go to State Attorney Shai Nitzan for a review, which takes about a month. Nitzan will then hand the case off to Mandelblit, whose review is likely to take another three months. If Mandelblit decides to indict Netanyahu, he would be required to appear at a closed hearing sometime around February 2019. The police recommendations came more than a year after Israeli news media first reported thatNetanyahu had been grilled by police investigators for more than three hours at his official residence on suspicion of receiving illicit gifts and favors from wealthy donors. 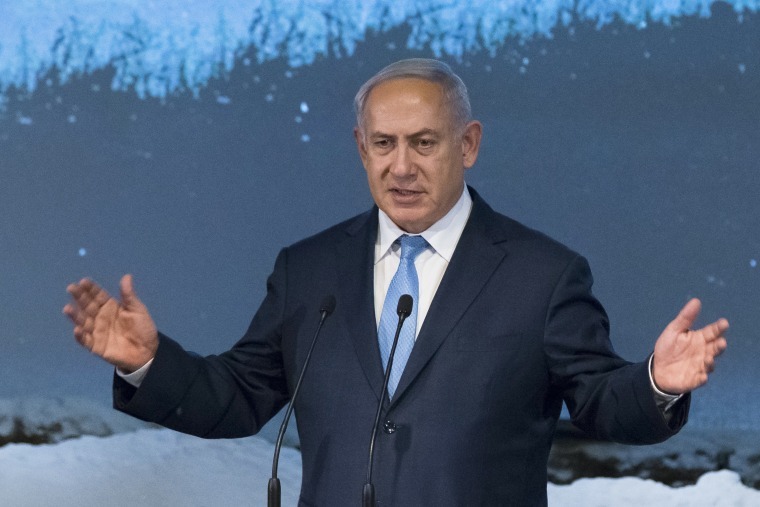 In a televised speech on Tuesday, Netanyahu once again called the charges "baseless," and said, "I'll continue to lead Israel responsibly as long as the people of Israel elect me." Taking a page from his ally President Donald Trump, Netanyahu also went on the attack against the investigators. "The police is infected with hallucinated allegations, the police can’t be objective," he said. "I’m sure that the attorneys will find that nothing i did was incorrect." But a former Israeli prime minister, Ehud Barak, said Netanyahu should consider stepping down. "These are difficult and sad times," Barak said on social media. "The picture emerging from the police recommendation is chilling. The depth of corruption is staggering." "Netanyahu should declare himself incapacitated tomorrow morning, and the Likud party needs to decide who will replace him," Barak added. Netanyahu, 68, who is serving his third consecutive term as prime minister and his fourth overall, has repeatedly denied any wrongdoing. He even leveled a public broadside last week against Israeli Police Chief Roni Alsheikh, who is leading the investigation. After Alsheikh told Israeli television that "powerful figures" had hired people to "sniff around" the detectives working on the Netanyahu case, the prime minister accused him of saying "delusional things." Earlier, after Netanyahu was questioned by police, he tweeted, "There won't be anything because there is nothing." He also decried "years of daily persecution against me and my family." But Netanyahu and his family's luxurious lifestyle — often at taxpayers’ expense — has come under scrutiny before. Five years ago, Netanyahu was criticized for reportedly spending $127,000 in public funds for a special sleeping cabin for a five-and-a-half hour flight to London for Margaret Thatcher's funeral. That came just months after the Netanyahu family's taxpayer-funded food budget included $2,700 for artisanal pistachio and French vanilla ice cream.